Hotel workers voted in overwhelming numbers yesterday to give our union leadership the authority to call a strike if necessary. Over 93% of the workers who came out for the series of mass meetings voted for the strike authorization -- 2,241 to be exact, while a mere 168 voted no. Significantly, nearly 60% of the workers in the Multi-Employer Group (MEG) bargaining unit turned out for the vote. This is a tremendous victory for solidarity in the union, especially given that hotel workers have a vivid and painful memory of spending nearly two months on the street just two years ago, that we have been working without a contract for two years, and haven't had a raise in three years. If the hotel bosses thought that they had beaten us up enough to make us say uncle, they were dead wrong. Instead, it is a fact -- not mere braggadocio rhetoric -- to say that the boss's intransigence has only hardened our resolve to fight this battle through to the bitter end. Next week's set of contract negotiations will probably tell the tale. As Local 2 President Mike Casey said over and over again at yesterday's mass meetings, the bosses have a business decision to make. 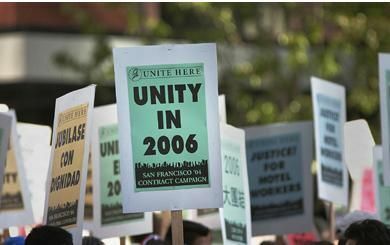 The union estimates that the 2004 strike and lockout, and the ongoing boycott of the last two years, have cost the MEG hotels around $100 million in lost business. Just how much more of this punishment are they able and willing to take? Just what are the hotel bosses holding out for? This is not a simple question. Of course, they want to save as much money as they can, and have no compunction about taking it out of our hides. But, in this era of 21st-century capitalism, these kinds of economic decisions are not always made in the old 20th-century way. Increasingly, the hotel industry -- like industry in general -- has become monopolized by a handful of giant multi-national corporations. The big players these days include Hilton, Hyatt, Holiday Inn, Marriott, Starwood, Intercontinental. This obviously means that the hotels can marshal tremendous resources in any fight they choose to take on, whether in San Francisco, New York or Chicago. But it also means that any one significant hotel corporation that chooses to break ranks can stir the pot in new ways. Two weeks ago, on August 9, UNITE HERE, the international union to which Local 2 belongs, announced a five-year agreement with the Hilton Hotels Corporation, dubbed a "Partnership for Future Growth." The practical meaning of this agreement is far from clear at this early stage, but it is certainly something new and different, and must have the rest of the hotel corporatocracy rubbing their eyes and scratching their heads. According to the UNITE HERE leadership, the union and the Hilton have agreed to "work together... on growth where it makes strategic and economic sense, including card check agreements where appropriate." Does this mean that the Hilton will allow card check agreements, clearing the way for the union to become the bargaining agent for Hilton employees without having to run the gauntlet of an election process conducted by the notoriously bureaucratic and pro-business National Labor Relations Board (NLRB)? If so, that is certainly a major step forward for hotel workers. UNITE HERE and the Hilton have also pledged to "work together toward labor peace... including Hilton receiving preferred status as a hotel management company of choice for the union..." and to create a "structure that binds the two parties to explore ways to enhance Hilton Hotels' productivity and competitiveness, especially in the area of food service and restaurants." I've got to admit, this 30-year member of the hotel and restaurant union is rubbing his eyes and scratching his head trying to figure out what that means. "With this agreement," UNITE HERE General President Bruce Raynor says, "Hilton proves it cares about the people who create the guest experience... That means better hotel jobs, better customer service and a healthier industry. And hotel guests who care about working people can now choose a hotel with confidence, knowing they are choosing a hotel that values working people." 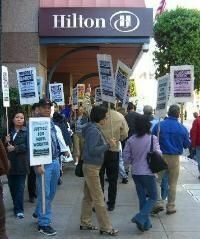 Yet, just a month ago, on July 21, Local 2 held a mass picket line at the San Francisco Hilton, dubbed the "Hilton Siege." Over 1300 workers turned out in a show of force against the hotel corporation that, up to then at least, was understood to be one of the most hard-line members of the MEG. Perhaps, given the stresses and strains that must currently exist within the MEG, it is not hard to understand why a number of major San Francisco hotels have chosen to remain outside of the MEG, including the Marriott, the Clift, the Huntington, the Parc 55, the Stanford Court, the Sir Francis Drake, and several others. This is much different than during the last major city-wide hotel strike in 1980, when nearly all of the big hotels were united in the now-defunct Hotel Employers Association (HEA). The lack of solidarity among the hotel bosses, if we can apply that sacred word to those scoundrels, certainly gives the union more room to maneuver. But it also creates a more complicated situation for the union.